Climate change has caused a catastrophic drop in the numbers of terns, kittiwakes and puffins at Sumburgh Head, Shetland, explains this article from The Guardian. Sumburgh Head lies at the southern tip of mainland Shetland. This dramatic 100-metre-high rocky spur, crowned with a lighthouse built by Robert Louis Stevenson’s grandfather, has a reputation for being one of the biggest and most accessible seabird colonies in Britain. Thousands of puffins, guillemots, razorbills, kittiwakes and fulmars gather there every spring to breed, covering almost every square inch of rock or grass with teeming, screeching birds and their young. Or at least they used to – for this year Sumburgh Head is a quiet and largely deserted place. Where seabirds once swooped and cried in their thousands, only a handful of birds wheel round the cliffs. The silence is uncanny – the result of a crash in seabird numbers that has been in progress for several years but which has now reached an unprecedented, catastrophic low. 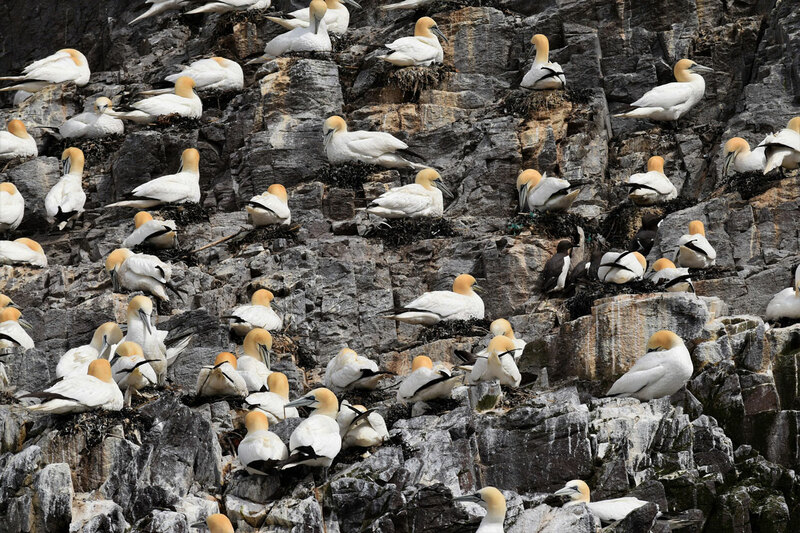 One of the nation’s most important conservation centres has been denuded of its wildlife, a victim – according to scientists – of climate change, which has disrupted food chains in the North Sea and North Atlantic and left many seabirds without a source of sustenance. The result has been an apocalyptic drop in numbers of Arctic terns, kittiwakes and many other birds. “In the past, Sumburgh Head was brimming with birds, and the air was thick with the smell of guano. The place was covered with colonies of puffins, kittiwakes, fulmars, and guillemots,” said Helen Moncrieff, manager of RSPB Scotland’s office in Shetland. This grim description is backed by figures that reveal the staggering decreases in seabird numbers in Shetland, the most northerly part of the British Isles. In 2000, there were more than 33,000 puffins on the island in early spring. That figure dropped to 570 last year and there are no signs of any recovery this year, although it is still early in the season. Similarly, Shetland’s kittiwake population plummeted from over 55,000 in 1981 to 5,000 in 2011, and observers believe those numbers have declined even further in the past few years. Only the lack of a properly funded census has prevented ornithologists from putting precise numbers on the devastation that is occurring. The causes of these devastating declines are many, according to scientists – though most agree that the disappearance of food sources is the main reason. Seabirds rely heavily on sand eels for food, and this supply was severely depleted in northern waters by fishing – though this was eventually halted, allowing stocks to recover. However, these have now been disrupted again by global warming, triggered by rising carbon dioxide emissions from factories, cars and power plants that burn fossil fuels. Temperatures in the North Sea and North Atlantic have risen significantly as a result. Not every coastal area of the UK is affected to the same degree, as has been highlighted in a recent project carried out by the RSPB. Groups of puffins, one of the seabirds worst affected by the current crisis, were tagged at two different locations: Shetland and the Shiant Islands, in the Inner Hebrides, where numbers have remained relatively stable in recent years. In the latter, the birds were found to travel on very short journeys of a few kilometres before they returned to their young with plenty of plump fish. A similar story is provided by trackers fitted to guillemots and razorbills from nearby Fair Isle, which has also suffered serious seabird population losses. They too are having to travel hundreds of kilometres to find food. “It explains clearly why our colonies have foundered,” said Dunn.